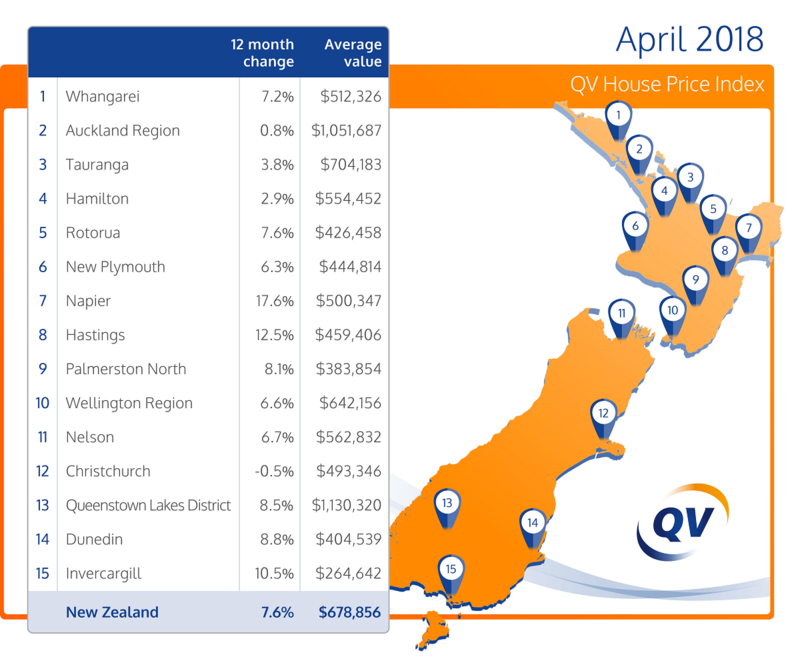 The latest monthly QV House Price Index shows nationwide residential property values for April increased 7.6% over the past year, while values rose 1.1% over the past three months. The nationwide average value is now $678,856. When adjusted for inflation the nationwide annual increase drops slightly to 6.4%. Meanwhile, residential property value growth across the Auckland Region increased slightly by 0.8% year on year although values dropped by 0.3% over the past quarter. The average value for the Auckland Region is now $1,051,687. When adjusted for inflation values dropped 0.3% over the past year. Values across the Auckland market vary although not significantly. North Shore values rose 3.2% in the year to April 2018 and 0.4% over the past three months. The average value there is now $1,233, 394. The former Auckland City Council central suburbs rose 0.6% year on year and were 0.8% up over the past three months and the average value there is now $1, 086,879. Waitakere values dropped 0.2% year on year but they increased slightly by 0.2% over the past three months. Manukau dropped by 0.3% year on year and 0.4% over the past three months; Papakura values rose 1.1% year on year and 0.1% over the past three months and the average value there is now $701,123; Franklin values also rose 0.2% year on year and Rodney values were also up 0.1% year on year. Hamilton City home values rose 1.7% over the past three months and values increased 2.9% in the year to April. The average value in Hamilton is now $554,452. Tauranga home values rose 3.8% year on year and 0.8% over the past three months. The average value in the city is $704,183. The Western Bay of Plenty market rose 6.8% year on year and 2.2% over the past three months. The average value in the district is now $630,703. Values across the whole Wellington Region rose 6.6% in the year to April although dropped 0.3% over the past quarter and the average value is now $642,156. Wellington City values increased 5.1% year on year but dropped 0.4% over the past three months and the average value there is now $761,400. Meanwhile, values in Upper Hutt rose 9.3% year on year and 3.5% over the past three months; Lower Hutt rose 6.8% year on year and 2.7% over the past quarter; Porirua rose 7.3% year on year and dropped 0.2% over the past quarter. Finally, the Kapiti Coast rose 13.4% year on year and 2.2% over the past three months. Christchurch city values continue recent trends, either remaining flat or seeing slight increases or decreases in value. Values dropped slightly by 0.5% year on year and by 0.2% over the past three months. The average value in the city is now $493,346. Values in Dunedin continue their upward trend having increased 8.8% in the year to April and 3.1% over the past three months. The average value in the city is 404,539. Dunedin – South saw the strongest growth with values up 9.8% year on year and 3.6% over the last quarter. The average value there is now $386,807. “Anecdotal evidence suggests some of the higher value residential vacant sections particularly around $300,000 are being met with some resistance by the market. Nelson residential property values rose 6.7% in the year to April and 0.8% over the last quarter. The average value in the city is now $562,832. Meanwhile values in the Tasman District have also continued to rise, up 8.5% year on year and 0.9% over the past three months. The average value in the Tasman district is now $565,906. The Hawkes Bay region continues to see significant value growth. Napier values rose 17.6% year on year and 3.4% over the past three months. The average value in the city is now $500,347. Hastings values are also continuing to rise up 12.5% year on year and 1.3% over the past three months. The average value there is now $459,406. The Central Hawkes Bay has also seen values rise 19.8% year on year and 2.7% over the past three months and the average value there is now $315,767. QV Hawkes Bay Property Consultant Nicola Waldon said, “Activity has picked up over the past month which can be partly attributed to vendors aiming to take advantage of the fact they can achieve high sales prices in the current market and before any possible slowdown in strong value growth seen over the past couple of years. In the North Island, the growth continues across many regional centres. South Wairarapa experienced the greatest value growth over the past year, up 23% while Wairoa experienced the highest rate of growth over the past quarter, up 8.6%. Growth remains strong in the Hawkes Bay region, with Napier and Hastings continuing to appeal for many out-of-town buyers. In the South Island, Waitaki saw the greatest annual value increase, up 13.8%, while Gore experienced the highest quarterly increase in the regions, up 4.2%. Most notably, Mackenzie dropped in value over the past quarter, down 4.5% although still up by 12.1% over the past year. The deep South continues to see consistent value increases across most regions, particularly Invercargill and across Central Otago.